Now this is a very interesting question for all businesses, and one that I am asked to clarify on a regular basis by my clients. As my business is called Sales Growth Expert, I guess it’s one I should know! There are as many similarities as there are differences between sales and marketing. Both are aimed at increasing your revenue; and the more interlinked they become, the harder it is to differentiate between them. In a small company, the two disciplines tend to be thrown together in the same pot but as your business grows, a clearer distinction has to be made and this is where you need specialist staff to concentrate on them independently. What are the main differences between the two? Let’s think about this for a moment: if you didn’t have marketing you wouldn’t have any leads to follow up with, but on the other hand without any expertise in sales and a strategy to back it up, you won’t be successful in closing deals. In a nutshell, marketing is everything you do to reach and persuade potential customers to buy from you, and sales is everything you do to close the sale so you have an agreement or contract in your hands. Your marketing should consist of strategies of how to persuade your prospects that you are the company for them, making sure you measure their success, too. Marketing, essentially, is the message that prepares the prospect for the sale. There are many different methods of marketing but mainly you can think if it as the ‘4 Ps’: Price, Place, Promotion and Product. It’s marketing’s job to make potential buyers aware of the product or service, and, ideally, predispose them to choosing their brand when the need arises. Sales, on the other hand, is a process which relies heavily on interpersonal interaction and to watch out for that need that marketing has generated. It is often done via a one-to-one meeting, networking or cold calls. It’s anything that engages you with your customers on a personal level rather than at a distance. The aim is to have potential customers reach you, or become aware of you, via your marketing efforts. Then, ideally, keep the customer happy so that they repeat the purchase regularly. 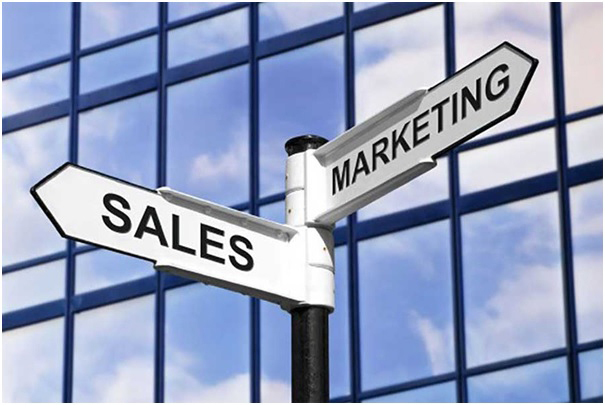 Both sales and marketing are vital to the success of your business. You can’t do without either of them and so if you plan and execute a strategy which combines the strengths of both sales and marketing, you’ll experience successful growth. Imbalance in either of these areas can lead to growth being derailed, though. If that’s all quite clear, then how come I often see sales and marketing teams in the same company competing directly with one another, fighting for recognition? It’s the old chicken and egg conundrum. Did the sales department bring in the sale with their sales and order cards or was it the marketing team’s 4P approach that clinched it? The answer, of course, is that both are responsible for the result. Any SME needs to be absolutely clear about their commercial strategy. They need to know what they are selling, to whom, at what price, and where, how and when they are planning to make the sale. Only then can you draw up an effective marketing and sales plan. The rise and rise of social media has meant that it’s been relatively quick and easy for businesses to broadcast their messages to the world. We can tweet, blog, post on Facebook, connect on LinkedIn, send tailored emails, as well as communicate in the more traditional ways by phone, face-to-face and using the post. The key thing here is that we can do this both for marketing and for selling purposes now. I can hear you asking though – when is it sales, and when is it marketing? Crucially, companies of any size should have both marketing and sales activities focused on giving value to the person that is parting with their money, be they an end consumer or a business. This is the fundamental unifying factor that brings marketing and sales together: what I call ‘Smarketing’. The full length of the ‘Customer Journey’ needs to be travelled together, with the same value messages and experience. 1. Target market: Be clear on exactly what you want to sell, and to which target market. If you are an accountant looking for more architects as clients, for instance, then make sure that your services and packages are tailored specifically to architects. 2. Strategy: Create your marketing strategy with that target customer in mind. Talk to their problems and their opportunities. Tap into what makes them smile, as well as what keeps them awake at night. These are the two reasons that people buy, and this applies to anything. 3. Consistency: Be consistent wherever you are connecting with potential, and existing, customers. If you are a mortgage broker looking to sell to high-end commercial clients, then your content and message needs to talk to that niche about how you can help. Your website, free resources, blogs, networking opportunities, LinkedIn profile, email campaigns and speaking opportunities must then target those particular clients who are looking for mortgages. 4. Think long-term: Give it time. If your aim is to demonstrate your authority in a field, then a couple of blogs and a special offer is not going to cut it. Run your campaign over a period of at least 6 months, and longer if necessary. 5. Call-to-actions: Have a call-to-action with EVERY connection you make, whether on-, or off-line. This is where the marketing becomes ‘Smarketing’. Once you have demonstrated enough value in your marketing, people will move towards buying. Make it very clear what your potential customer needs to do next if they are interested in finding out more. Add contact boxes to your blogs, take fliers to your networking events, add buying options to everything. This shows how you can really help them. Remember, everything you do in your business is marketing the company, every connection you make has a potential sales message, and therefore needs a call-to-action.